Browse: Home / Nishang v0.6.8 – PowerShell for penetration testing and offensive security. 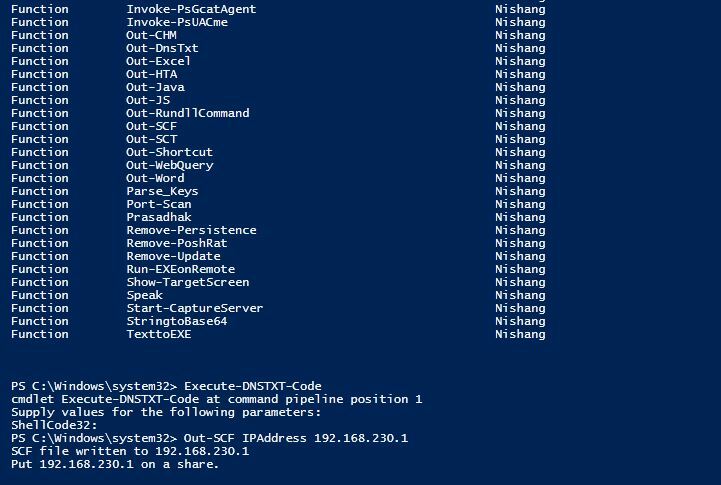 Nishang v0.6.8 – PowerShell for penetration testing and offensive security. + Added Out-SCF in the Client directory. The script generates a SCF file. The file (default name “SystemCatalog.scf”) needs to be put on a share. Whenever a user opens the file on the share, his credentials are sent to the specifed capture server. the IP address of the capture server is specifed in the icon field. Nishang is a framework and collection of scripts and payloads which enables usage of PowerShell for offensive security and penetration testing. Nishang is useful during various phases of a penetration test and is most powerful for post exploitation usage. Nishang v-0.6.2 released: PowerShell for penetration testing and offensive security. Scripts; Nishang currently contains the following scripts and payloads. – HTTP-Backdoor : A backdoor which can receive instructions from third party websites and execute PowerShell scripts in memory. – DNS_TXT_Pwnage : A backdoor which can receive commands and PowerShell scripts from DNS TXT queries, execute them on a target, and be remotely controlled using the queries. – Execute-OnTime : A backdoor which can execute PowerShell scripts at a given time on a target. – Gupt-Backdoor : A backdoor which can receive commands and scripts from a WLAN SSID without connecting to it. – Add-ScrnSaveBackdoor : A backdoor which can use Windows screen saver for remote command and script execution. – Invoke-ADSBackdoor : A backdoor which can use alternate data streams and Windows Registry to achieve persistence. – Out-CHM : Create infected CHM files which can execute PowerShell commands and scripts. – Out-Word : Create Word files and infect existing ones to run PowerShell commands and scripts. – Out-Excel : Create Excel files and infect existing ones to run PowerShell commands and scripts. – Out-HTA : Create a HTA file which can be deployed on a web server and used in phishing campaigns. – Out-Java : Create signed JAR files which can be used with applets for script and command execution. – Out-Shortcut : Create shortcut files capable of executing commands and scripts. – Out-WebQuery : Create IQY files for phishing credentials and SMB hashes. – Enable-DuplicateToken : When SYSTEM privileges are required. – Remove-Update : Introduce vulnerabilities by removing patches. – Download-Execute-PS : Download and execute a PowerShell script in memory. – Download_Execute : Download an executable in text format, convert it to an executable, and execute. – Execute-Command-MSSQL : Run PowerShell commands, native commands, or SQL commands on a MSSQL Server with sufficient privileges. – Execute-DNSTXT-Code : Execute shellcode in memory using DNS TXT queries. – Check-VM : Check for a virtual machine. – Copy-VSS : Copy the SAM file using Volume Shadow Copy Service. – Invoke-CredentialsPhish : Trick a user into giving credentials in plain text. – Get-Information : Get juicy information from a target. – Get-LSASecret : Get LSA Secret from a target. – Get-PassHashes : Get password hashes from a target. – Get-WLAN-Keys: Get WLAN keys in plain text from a target. Log keystrokes from a target. – Get-PassHints : Get password hints of Windows users from a target. – reate-MultipleSessions : Check credentials on multiple computers and create PSSessions. – Run-EXEonRemote Copy and execute an executable on multiple machines. – Invoke-NetworkRelay Create network relays between computers. – Prasadhak : Check running hashes of running process against the VirusTotal database. – Brute-Force : Brute force FTP, Active Directory, MSSQL, and Sharepoint. Powerpreter : All the functionality of nishang in a single script module. – Invoke-PsGcatAgent: Execute commands and scripts sent by Invoke-PsGcat. – Invoke-PowerShellTcpOneLine : Stripped down version of Invoke-PowerShellTcp. Also contains, a skeleton version which could fit in two tweets. – Invoke-PowerShellUdpOneLine : Stripped down version of Invoke-PowerShellUdp. – Invoke-PoshRatHttps : Reverse interactive PowerShell over HTTPS. – Invoke-PoshRatHttp : Reverse interactive PowerShell over HTTP. – Invoke-PowerShellWmi : Interactive PowerShell using WMI. – Invoke-PowerShellIcmp : An interactive PowerShell reverse shell over ICMP. – Add-Exfiltration: Add data exfiltration capability to Gmail, Pastebin, a web server, and DNS to any script. – Add-Persistence: Add reboot persistence capability to a script. – Remove-Persistence: Remote persistence added by the Add-Persistence script. – Do-Exfiltration: Pipe (|) this to any script to exfiltrate the output. – Download: Transfer a file to the target. – Parse_Keys : Parse keys logged by the keylogger. – Invoke-Encode : Encode and compress a script or string. – Invoke-Decode : Decode and decompress a script or string from Invoke-Encode. – Start-CaptureServer : Run a web server which logs Basic authentication and SMB hashes. ← Xdigger Framework is a Network Security Testing Assist Framework.